Fantastic accommodation, amazing location. Mako Cottage is conveniently located just a 20 minute stroll from the Fullers passenger ferry and rests on the fringes of Waiheke Island's main village (Oneroa). Take full advantage of short walks to experience 1st class dining and award winning wines at Mudbrick and Cable Bay Vineyards or relax at any one of Oneroa's friendly cafes or restaurants. You won't believe how convenient Mako Cottage is to an array of Waiheke's attractions including the magnificent Oneroa Beach (5 minute stroll away) offering perfectly safe swimming and relaxation, Waiheke's Arts and Crafts centre "Artworks" and the local "Picture Theatre" with current movies (seating: comfy couches!) within 150 metres away, children's playgrounds, coastal walks and of course shopping in the village itself, all within easy walking distance. Mako Cottage is an ideal location for anyone visiting Waiheke, perfect for couples, wedding guests, families and friends to relax and enjoy. The two double bedroom cottage has been recently renovated Oct 2016 with total new fitout in the kitchen and bathroom. Recently (Aug 17) we have a brand new Chiromatic King bed for extra comfort. The cottage features great outdoor living, BBQ on private deck, garage with internal access makes a great home away from home for the pets (large dog kennel outside and fully fenced front half of section), has full My Sky TV, Free Wireless Internet plus stereo with docking station for Ipod and socket for MP3 players. All the comforts of home. Fresh fruit and vege, pharmacy, convenience stores and Waiheke Wine Centre all within easy walking distance. COMPLIMENTARY Tea, coffee, sugar. Fresh fruit from our trees (seasonal) Kids board games. Only 1 minutes drive from ferry terminal or 10 minutes from Sealink car ferry. Firewood is supplied mths of june-August only. Alternatively there is a oil column heater. Very handy to all amenities to the local village, theatre, restaurants, beaches, public transport, top-notch wineries. Extremely easy access to village, no hills to walk up and down. Bring your well trained pets and walk the beautiful coastal walks. oil column heater Fireplace between June and August. Modern, well equipped cottage in a great location. Diane’s property is beautiful and situated perfectly to attend our son’s and newly minted daughter’s in law wedding ceremony at Mudbrick. The property was pristine and well equipped for our arrival. The beds were dressed and freshly cleaned towels were already in the bathroom. While there is no sea view from this property, the view from the deck is still quite beautiful. It’s a very short and pleasant walk to the village where cafes, restaurants, bars and shops are waiting to fill every need. If you ever find yourself planning a visit to Waiheke Island, I highly recommend the Mako Cottage! 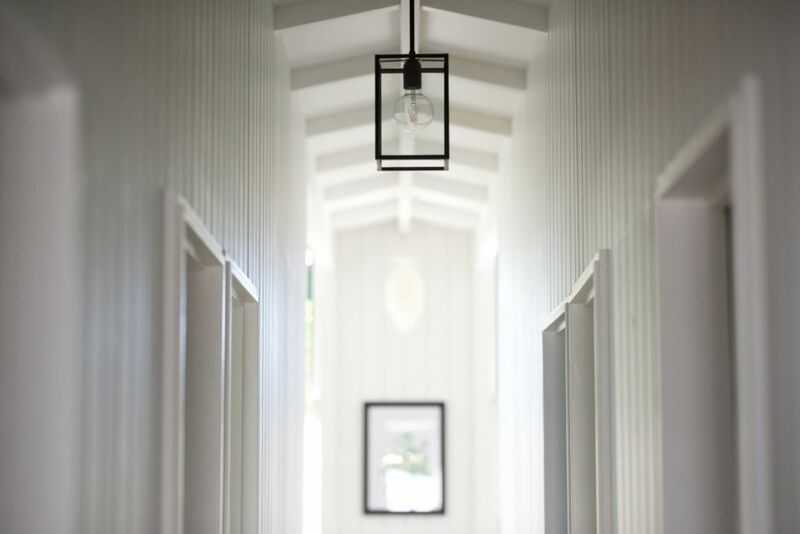 This is a lovely house with a clean, white, beachy feel. Beds are comfy and Denise is very responsive. You can take a short walk into town and down to the beach. Highly recommend. We felt very welcomed when we arrived at Mako cottage - there are lovely touches everywhere, from the colourful flowers in the garden to the pot plants and beachy touches inside. The cottage is beautifully presented and clean and the owner has thoughtfully provided everything one might need for a home away from home. We appreciated the fully fenced front section for our dog and it was a great to be able to walk (less than five mins), up to Oneroa to watch Christmas parade. Thanks for a lovely stay! The decor in this 2 bdrm plus house is very tastefully done. All the amenities are on hand, staying here felt like we were in luxury accommodation. An easy 7 minute walk to Oneroa shops which had a great selection of bars and restaurants. Will definitely recommend this place to others and do plan on returning again. This cottage was great - it's in a fantastic location, is equipped with everything you need and is also very dog friendly.